Have as much free space as possible on your start-up hard drive. If you don’t know how much free space you have check the Volume Browser. Quickly clear space by deleting PSD files that you accumulate over time. 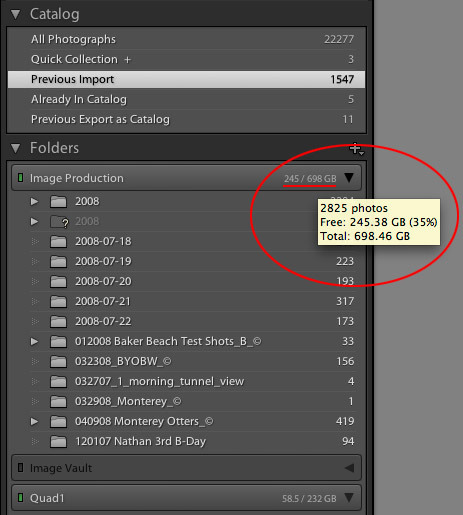 Granted you’ll want to back them up first.Â Friday Tip – PSDs and Drive Space – via Matt K. again at APKLT. 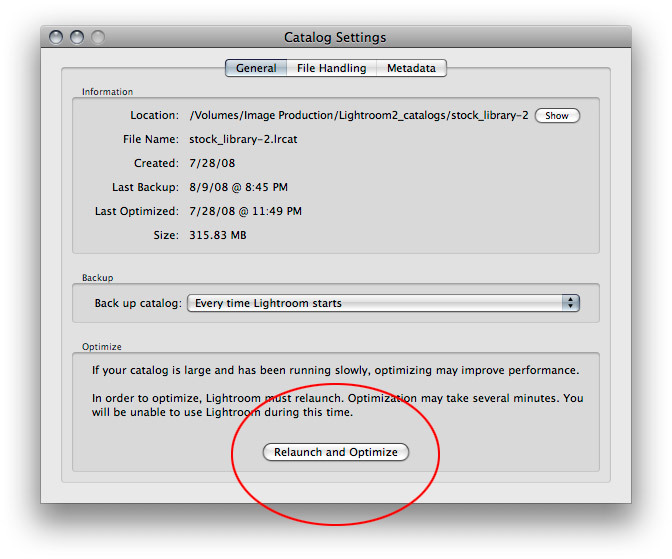 Utilize the Catalog Optimization feature (after backing up your catalog) and adjust the Preview Cache to the appropriate resolution. 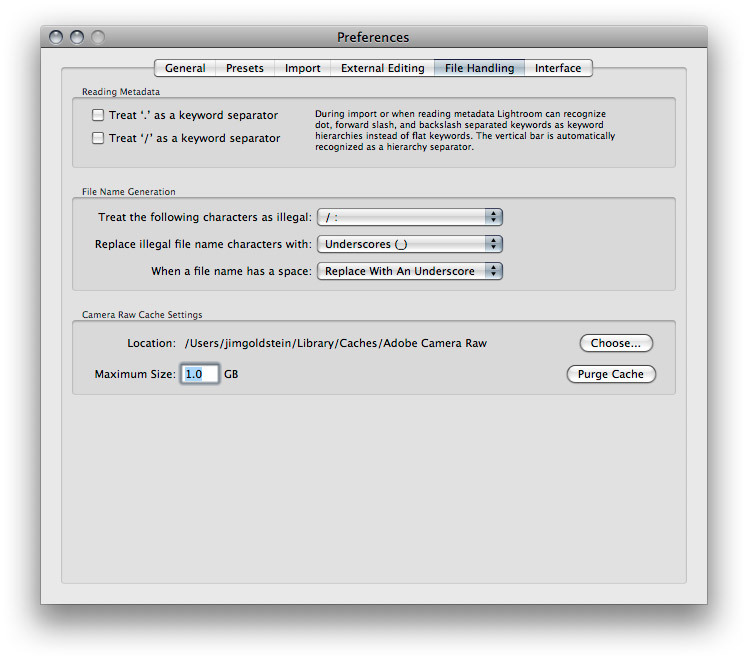 If you don’t need Metadata suggestions deactivate it to help boost performance. 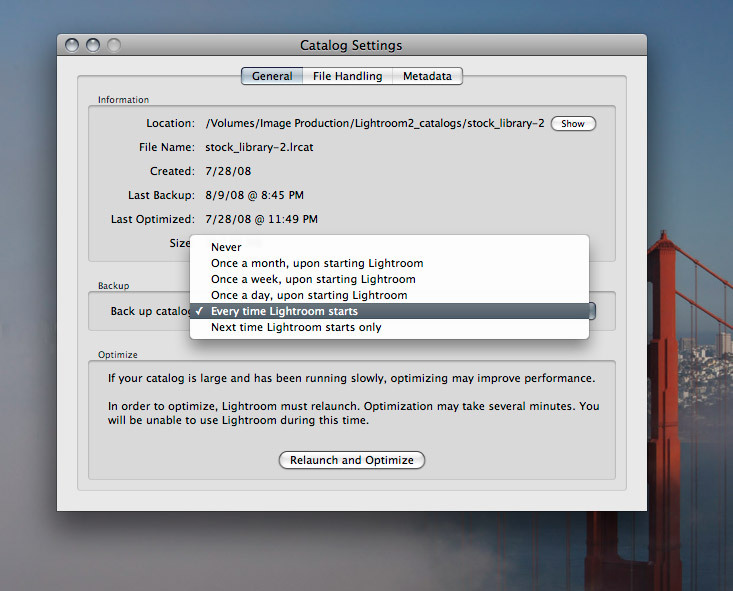 Note: Changing the preview size will not impact existing images in Lightroom. To apply these changes to existing preview images use Library -> Previews -> Discard 1:1 Previews menu item. This can take a while so it might be best to conduct this overnight depending on the size of your catalog. Also note that such optimization steps need to be applied to each individual catalog you may have. Every time you open an image in Camera Raw the full resolution of the image must be loaded into Camera Raw…as you can imagine, this can be pretty processor intensive…the Camera Raw cache will cache recently opened images to make re-opening them faster. There’s a preference limit to determine the size and the cache will remain constant in size by flushing out older cache files when newer images are loaded into Camera Raw. In the Camera Raw preferences, you can choose how large a cache to allow, where it is stored and you can purge the cache from there. If you have a large amount of free disk space on your drive, I would actually suggest increasing the cache for improved performance. If space is tight (like on a laptop) you can reduce the cache preference. For example, on one of my catalogs, I only ever look in Grid mode if I’m in the Library module, or I’m switching to Develop module (which reads the full res file anyway), so on that catalog I have the smallest lowest quality previews – I don’t need anything bigger. On another catalog, I often view the images in Loupe mode on a 23″ high res screen, so those I have set to a large preview and a medium quality. When you say you’re having to wait 10 seconds for a preview to show up, I’m guessing you’re in Develop module? The thing you need to understand about that is that it first shows the preview file, then does a quick read of the raw file, frees up the sliders, and then finishes reading the raw file properly. Your preview setting will only affect the very first view you see, and after that it’s down to disc read speed, whereas in Library module you are viewing the previews you’ve already created. Best thing you can do in Library module is to render previews before you start looking at the files, either in the Import dialog or by selecting all and using Library menu > Previews > Render Standard Previews. Once a copy has been made be sure to back it up to reliable media whether a second drive to keep off-site or to a DVD. Nothing can impact productivity more than losing your catalog. By default it should be multiple display performance mode. Change this to a single display performance mode.